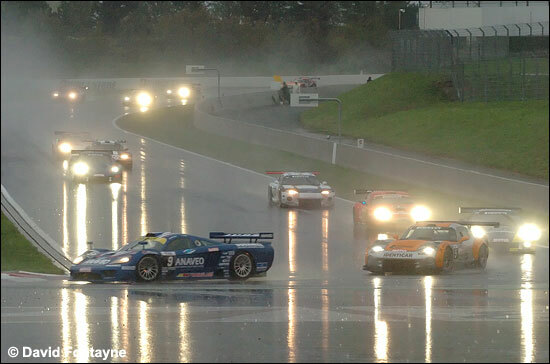 A few minutes before the start of the race, a violent downpour descended on the circuit – and the Race Director sensibly chose to give the start behind the safety car. The grid shot, above, provides no clues as to what is just about to arrive. After the first lap, the poleman, Hernandez (Saleen S7R) was in the lead, ahead of Hélias's First Racing Viper, Kuismanen's PSI C6.R and Bornhauser's VBM Ferrari. These four men widened a gap on the rest of the field, where seven men were fighting hard: Debard (Tarrès Viper), Dubreuil (CD Sport Viper), Lesoudier (#10 Mirabeau Viper), Balthazard (Larbre Ferrari 550), Bervillé (SRT Corvette C5-R), Blanchemain (Euroflash Autovitesse Viper) and Lagniez (Mirabeau Viper - nos. 11 and 12). Soon, positions were changing in the horrible conditions. On the third lap, Hélias succeeded in passing Hernandez for the lead and he escaped into the distance. Pertti Kuismanen in the PSI C6.R had an off in the Adelaide corner and had to retire. 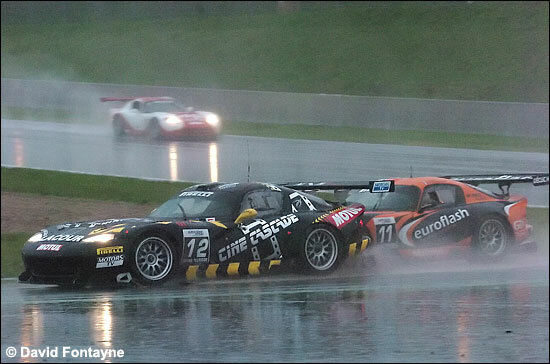 Five cars were ‘shining’ through the gloom and the rain - four Vipers and one Corvette. Bruno Dubreuil moved up to third place, ahead of Bervillé, Lesoudier, Blanchemain and Lagniez. After the driver changes, the ANAVEO Saleen was retired, owing to a chronic lack of visibility. 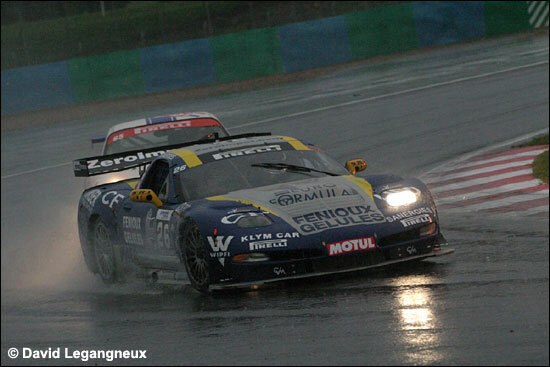 Peyroles, who had taken over from Hélais at the wheel of the #5 Viper, had to retire with a flooded engine! Three men were fighting for first place: Zangarelli (#12 Mirabeau Viper), Bouchut ( SRT C5-R) and Anthony Beltoise (Jean-Pierre Beltoise's son). Beltoise it was who took the lead – a wet weather expert, just like his father – pulling out a 20 second lead ahead of Zangarelli, who was threatened by Bouchut. Giroix (First Racing Viper) overtook Gilbert (CD Sport Viper) for fourth place. On the last lap, Beltoise in #10 had a spin, his rear wing was damaged and he had to slow down, but he succeeded in crossing the finish line first, 1.5 seconds only ahead of Zangarelli who could control Bouchut. So, it was 1-2 for Mirabeau. 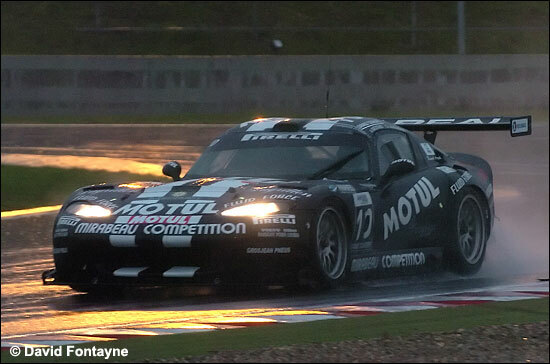 The British GT winner was an amazing sixth (story covered here), followed by the Soave / Cayrolle Corvette. Anthony Beltoise: “Two years ago, we won the race in same weather conditions and I have been able to catch up too. It was a tough race because I didn't have brakes any more within 16 minutes of the finish, and I nearly lost everything on my last lap. I had a spin, and when starting again I hit the barrier and damaged the wing. Fortunately, I succeeded in getting out of it, and we won the race. I love this track. One more win this season, and I am happy because we were very close to the victory at Dijon with Gael Lesoudier. Racing with Mirabeau is racing in a family, it is a good team, with a fantastic atmosphere." Mathieu Zangarelli: “Jean-Claude Lagniez ran a great race and I was in the lead. The track was still very wet, so I didn't push too hard in my early stint, and Anthony could close the gap quite incredibly. Soon, I had some problems, I don't know really what it was. We'll have to solve them for the qualifying session tomorrow. Christophe Bouchut could come back in the end, but there were only two laps left, so there was no question of losing my second place." With thanks to Frédéric Espinos, with images by David Fontayne and David Legangneux.